It feels like just yesterday Nic marched me into Buy Buy Baby to complete my baby registry. I remember walking in and promptly turning around to walk back out as it was far too overwhelming for this first time mommy. Fast forward to nearly two years later and I actually enjoy going in there. 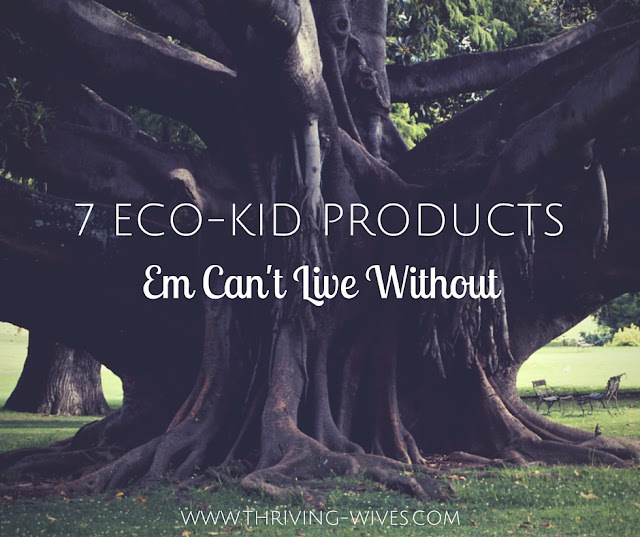 The chance to analyzing their endless variety of products thrills me, especially when I get to choose the right eco-friendly supplies for my boys. As my littles are now approaching the 18 month mark (excuse me for a moment while I dry my eyes), I felt I had to share the products that I have come to be obsessed with as they now navigate toddlerhood. As children grow it seems as though they are always needing something new to assist them as they conquer their next milestone. Weather drinking from a baby bottle, eating on their own or potty training, there is always more to buy. 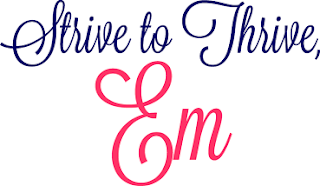 This eco-mommy loves to shop, so I welcome the chance to vote with my dollars and give money to companies that support a healthy world and healthy child. 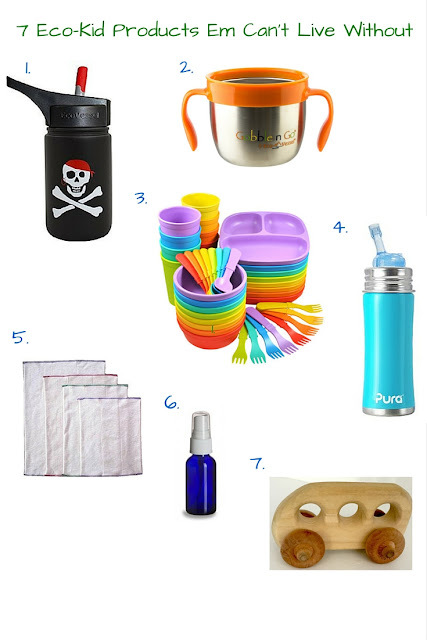 Here are my top seven obsessions for the environmentally/health conscious mommy. 1. Eco Vessel Water Bottle - I love, love, love these and was so thankful when Nic asked what I wanted the boys to have for their first birthdays. They are stainless steel and easy for little hands to carry. We take them everywhere and they go through at least three full bottles a day! 2. Eco Vessel Snacker - Same company, same great idea. These stainless and silicon snackers are perfect for when we are on the go and need to keep tantrums to a minimum. I can give them to the boys and they are perfectly content digging for goodies while we are out and about. 3. Re-Play Products - While I try to stay away from plastic, this brand makes plastic feel good to buy. All their products are made from recycled milk jugs and are perfect for families who care about the Earth. Since my boys refuse to be fed and much prefer dining with their plates and flatware, we can't get enough of their dishes and love the colors too! 4. Pura Kiki Bottle - Once my boys stopped using a baby bottle at around 10 months, they went straight to breast milk in a sippy cup. At one year, they were over that and ready to take on a straw. I had originally purchased these Pura Kiki's for them to use when they were younger, but they were just a bit too heavy for them to use on their own. As soon as they were stronger, it was simple to order their silicon straw set and get them in our rotation. 5. Cloth Diaper Service - Disposable diapers were never an option for me. I knew long before I was even pregnant that it was cloth diapers or bust for this eco-mommy. While many moms have no problem taking care of their own stash, that was not something I was ever interested in doing. Setting out bags of dirty diapers on my porch each week only to have them swapped for a clean set is well worth the cost. Only $24 dollars a week (for one that is) is WELL worth it to know that you are not adding to the billions of tons of waste that goes into our landfills from disposable diapers. 6. DIY Wipe Spray - I love making my own solutions as often as possible so I know exactly what is going in our home and on my boy's skin. That goes for wipes too. I started making my own wipe solution and cutting up old shirts to use instead of disposable wipes...except for massive poops, that gets a Costco wipe for sure. Otherwise, I use my little wipes then throw them into a bag to wash each night. 7. Handmade "Zoom Zooms" - My boys were given these amazing handmade wooden toys by a neighbor a few months ago and my TM and I fell in instant eco-love. We purchased 50 more!! Not only are these completely natural and safe but they are indestructible! The boys love their "zoom zooms" and I love them even more since I know they were made with care and are the safest for my little dudes. Taking buying local to a whole new level! 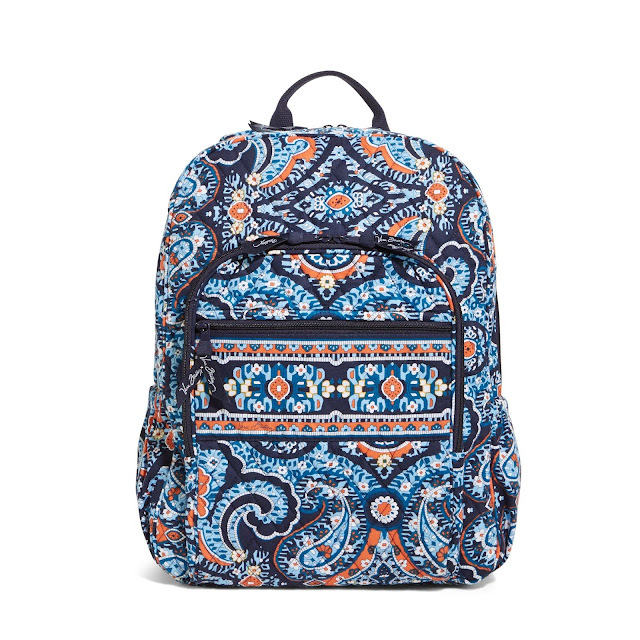 With my favorite and oh so perfect Vera Bradley backpack I can load all these amazing products easily inside as it is now my go-to diaper bag. It has more than enough space to hold water bottles, snackers, a couple cloth diapers and covers, wipe spray and even Re-Play forks for the boys to carry around...heck I can get two zoom zooms in there too! Watch out Mary Poppins! What are you favorite eco-friendly products for kids?